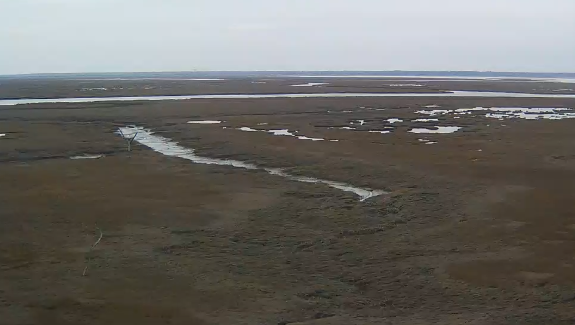 This is a live view from the osprey nest about 75 yards outside The Wetlands Institute. Our new high definition camera not only has night vision, it also has sound. To adjust or mute the sound, hover over the image with your cursor and click the speaker icon. If the camera feed stops, try refreshing your internet browser. Storms may cause power outages which will interrupt the feed. For Chrome users (if you get a green screen), be sure to uncheck “Use hardware acceleration when available” in Advanced Settings. The close-up nest camera is prone to outages when demand is high. Unfortunately, we have been unable to resolve that issue so far. We apologize for the inconvenience. Get updates, see pictures and join the discussion on Facebook. We are moving the osprey discussion to our new Osprey Talk Facebook group. Join us and be a part of it! 8/24/2017 – Lily and the two oldest chicks seem to have flown south by now but Marshal is still around, making sure the youngest chick is fed. 8/1/2017 – Two of the chicks have fledged! It happened yesterday. We have uploaded footage to our YouTube Channel. You can watch it here. 7/31/2017 – The camera feed has been intermittent and we thank you for your patience as we work through this issue. The chicks are very close to fledging. We are keeping a close eye on the nest and will be sure to record the moment on our in-house camera system so we can share it with you! 7/14/2017 – We were finally able to restore our livecam feeds! Just in time to watch the young ospreys as they start to exercise their wings! The oldest chicks are now 5 weeks old while the youngest is a day or two shy of the 5 week mark. Another 2 to 3 weeks and we will be watching for them to fledge! 6/27/2017 – We are experiencing camera feed issues but rest assured – all is well in the nest. The chicks are growing very rapidly and their feathers are starting to show. Although the younger chick is smaller and has had to take a back seat during feedings, he is persisting and is getting enough food to grow stronger every day. 6/19/2017 – Our chicks are growing very quickly! The third chick is much smaller than his siblings but he is hanging in there. Although it may seem like long delays at times, Marshal is providing regular meals for Lily and their growing chicks. 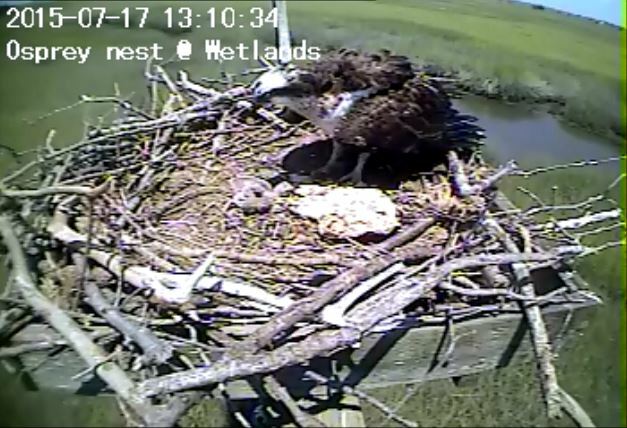 6/5/2017 – We have a full nest! The third chick hatched over the weekend. You can watch the family having lunch here or visit our Facebook page to view more updates. 6/1/2017 – Two in one day! The second chick hatched mid-afternoon! 6/1/2017 – The first chick has hatched! Welcome to the world little one! Click here to watch footage of the happy moment. 4/29/2017 – We have a third egg! 4/26/2017 – A second egg arrived around 9:55am today! 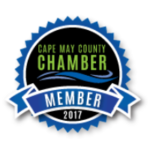 Join the conversation and see photos on Facebook! 4/23/2017 – We have an egg! Lily and Marshal are watching over their first egg which arrived today around 3:15pm. 3/30/2017 – New material seems to be appearing in the nest and mating activity has already been observed. 3/29/2017 – Lily has arrived! The two were spotted in the nest today. 3/28/2017 – Marshal is back in the marsh and he is spending quite a bit of time on the platform. As he awaits Lily’s return, you can watch on our livecams! Welcome back Marshal!! 9/2/16 – It is getting harder and harder to catch a glimpse of an osprey on the nest. A juvenile stopped by very shortly this morning but no sign of others since our last post. 8/28/16 – We have not been seeing two chicks in the nest at once for over a week now. Perhaps the friend has moved on. We did observe Marshall bringing fish to the nest today but haven’t been able to catch Lily on camera. 8/9/16 – After nearly a week, the “visitor” is now more of an “adopted sibling” to Fisher. The newcomer has begun catching her own fish and was even seen sharing with Fisher. They seem to be getting used to each other and we get a bonus osprey chick to watch grow! 8/5/16 – Our visitor appears to be interested in a more permanent stay than originally expected. Both chicks have been eating and Lily has even been observed feeding one of them to make sure they both get their fair share. Can’t tell them apart? Fisher is smaller and has a virtually spotless white chest. The newcomer has a spotted chest and she is slightly bigger. 8/4/16 – Fisher has fledged! We believe he took off for the first time around 9:30am. 8/3/16 – It seems like Fisher has a play date this morning! Another juvenile osprey is visiting the nest. Learning to fly, fledglings often land on neighboring nests. Osprey parents sometimes even feed the visiting fledglings – as Marshall has been doing – before the young head back to their own nest. This young however has been in our nest for nearly 24 hours now. Perhaps yesterday’s winds blew him off track and away from his own nest? 7/22/16 – Our osprey chick has a name! We received nearly 100 name suggestions and our panel of 6 judges rated their favorites. One name came up as a #1 pick for 4 out of 6 judges so we are pleased to introduce the world to Fisher. 6/29/16 – Lily and Marshal have given up on the remaining eggs but are giving their only chick a lot of attention. He is now 20 days old and growing very fast. 6/22/16 – The first chick is growing stronger each day but we suspect he might be the only one we get to watch grow up this year. It has now been 44 days since the 3rd egg arrived which is past the average. Although these numbers can vary, incubation period typically ranges between 35 and 42 days. 6/15/16 – Still one chick and two eggs in the nest. Marshal and Lily are being good parents and keeping him well fed and safe. 6/10/16 – We have a chick! It may not be easy to find on the photo but if you keep watching the live feed, you will see it move. Welcome to the world little one! 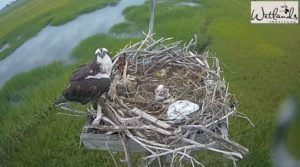 6/6/16 – Our Ospreys have names! We put it to vote and our Facebook fans chose Marshal and Lily. Egg #1 came 36 days ago so we expect it to hatch any day now! 5/9/16 – This morning, the female osprey on the nest became entangled in a plastic bag around her neck. We monitored the situation closely and consulted biologists with the NJ Division of Fish and Wildlife and Conserve Wildlife Foundation about possible responses. A benefit of the nest camera is that we were aware of the problem and able to monitor it. Fortunately, after several hours, the female left the nest while the male incubated, and was able to free herself without intervention. She is back to incubating her eggs. Marine debris is a serious issue with consequences for wildlife. Please do your part and make sure that you are not responsible for any loss of debris to the your surroundings and if you see any, please recover it and dispose of it properly. The good news is – we now have 3 eggs! 5/5/16 – Two eggs in the nest! 5/2/16 – We have an egg! It arrived just before 5pm on Sunday May 1. Unfortunately, the rain makes it difficult to see but there it is!. 4/6/16 – After observing a few daily visits over the recent days, we were able to catch the pair sharing lunch today! 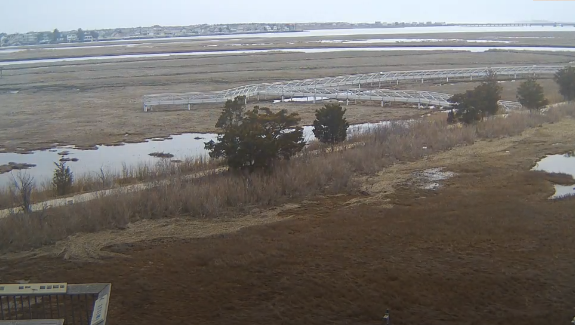 3/30/16 – After spending a windy day hunkered down in the marsh grass, our pair is back on the nest today. Mating activity has been observed and the male is bringing food for the female. So far, signs point to a successful nesting season! 3/28/16 – A male has now joined our female on the platform. The new camera allows a view of the perch in the background where he spent some of his time when not on the platform. 3/25/16 – A female osprey visited the nest for an extended period of time today. She was observed moving sticks around. 9/29/15 – Chance and dad were spotted this morning, on the platform by our walkway. Dad is still doing a good job feeding our little Chance who seems to be getting a hang at catching her own fish also. Chance’s future is looking brighter and brighter each day! You can still catch an occasional glimpse on the close-up camera but most of their time is spent on the other vacant platform. 9/22/15- Chance is getting more and more difficult to spot on the livecam but fear not, she is still around and dad is still here as well. We were able to observe him bringing her fish yesterday. We also spotted her on the empty platform near our walkway this morning. 9/14/15 – Chance has been spending time on another abandoned platform near our elevated walkway. She was also seen on the camera-monitored platform by our staff throughout the weekend. At nearly 10 weeks old, our young osprey has been flying for 11 days now. There are still several other ospreys in the marsh as of this date. 9/9/15 – Chance has been enjoying her new found freedom and spending less time in the nest. By now, she should begin attempting to forage for herself but she will need some practice before she is successful and can sustain herself. In the meantime, dad still delivers meals. Make sure to watch Chance from our new livecams! 9/4/15 – She (or he) did it! Chance has taken that first flight at 8:28am! She flew all the way to the elevated walkway and landed on it. She is now taking a well-deserved rest before returning to the nest. Mom and dad have been watching over her from a nearby platform. Keep watching for her return! 9/3/15 – Our little Chance may be late in the breeding cycle but she is very close to fledging! Today she has been observed multiple times making lift and hovering for several seconds over the nest. Both parents are still in attendance as of now and diligently paying attention to young Chance. Most adult (male and female) and fledgling ospreys on surrounding platforms in the area are still in attendance as well. Many New Jersey ospreys remain through September into October. We are hopeful for Chance’s success! 8/27/15 – A day in the life of Chance is spent eating fish, stretching and flapping wings, preening feathers, hopping around the nest and catching the occasional nap when flight practice becomes too hard. 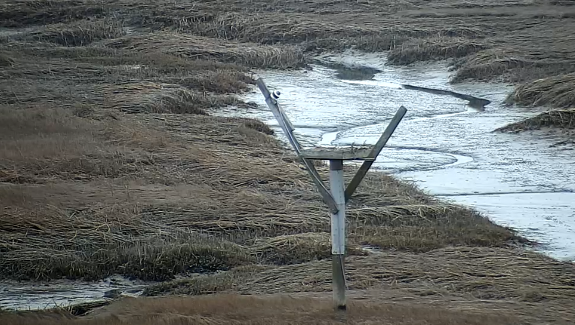 Mom and dad are still keeping a close eye on Chance, but prefer to rest on the posts of the platform or in the marsh. In the photo on the left, you can see Chance in the nest and mama resting on the platform post. Remember, practice makes perfect, so watch for Chance to fledge in the coming days! 8/21/15 – It’s official! Voting is closed and the name Chance has won out! Thanks to all who voted. Stay tuned as Chance gets ready to fledge! 8/19/15 – Six weeks old and full grown today! As we celebrate our chick’s milestone, we thought it fitting to give it a name. Our staff has selected four names to choose from: Hali, Fisher, Thumper and Chance. Voting closed on Friday 8/21/15 at 4:30pm. 8/17/15 – Hop, hop, hop! Our chick has been spending a lot of time hopping up and down around the nest learning the first steps in flying. 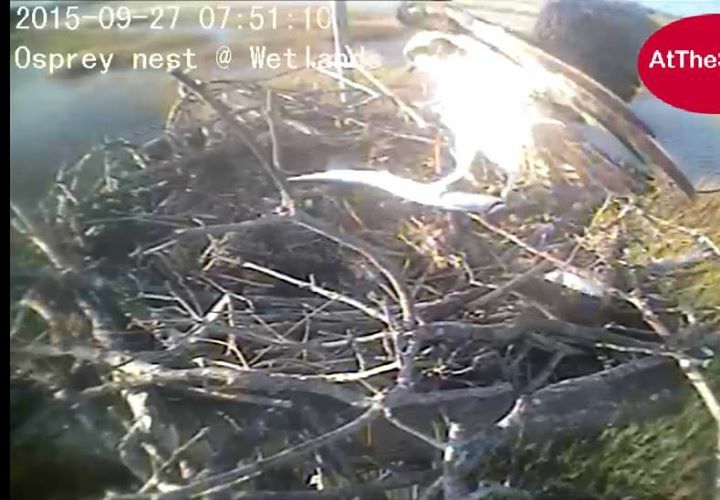 We know it can be challenging to see the little chick in the nest with all the condensation and ‘natural elements’ on the camera lens, but with the chick so close to fledging it would not be wise of us to disrupt the young chick and adult pair this late in the season. Stay tuned and watch for increased hopping and wing flapping action in the coming days! 8/12/15 – Five weeks old today and growing stronger each day! In fact, in just one more week, our chick will be full grown and is already showing signs of independence. It is beginning to explore around the edges of the nest, was observed picking up smaller sticks in the nest and rearranging them along the perimeter and is even trusted by the parents to be left alone in the nest for short periods of time. It’s amazing how quickly they learn! 8/3/15 – Our chick’s down is quickly being replaced by feathers! Look closely and you can see the flight and tail feathers beginning to emerge. Feathers attached to the ‘hand’ of the osprey are known as primaries; feathers attached to the ‘forearm’ are known as secondaries; and feathers attached to the ‘tailbone” are know as rectrices. Our chick is changing so quickly these days, so be sure to tune in daily! 7/29/15 – Our second osprey chick is exactly 3 weeks old today! You can see just how much it has grown since the last photo taken on 7/17/15. In just 3 more weeks, it will be almost full grown. From there, watch for it to fledge about 2-4 weeks later around September 2-16. This is late in the season for chicks to fledge, but we are hopeful for success! 7/27/15 – After a couple weeks of practice, and a few learning curves, this pair is providing their chick with great care! They have been observed securing and fortifying the edges of the nest, guarding and protecting the chick, and feeding it daily meals of eel, flounder and other fish. While Papa osprey continues to bring man-made objects into the nest, Mama osprey does a nice job of moving them to the sides of the nest, protecting their chick from harm. Keep up the good work you two! 7/14/15 – The first chick to hatch did not survive more than a day. The third egg was last confirmed yesterday and was still being incubated, though it had passed its expected hatch date. By the end of the day, the egg was no longer visible and may be covered by nest material or may have been removed from the nest. Thankfully our second chick continues to get stronger each day with close attention by both parents – its meal delivery (dad) and feeding (mom) service is keeping up with the demand. 7/8/15 – Our second osprey chick hatched this morning! 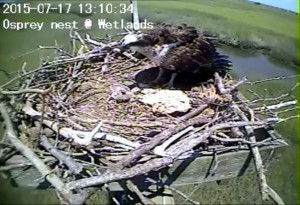 Both parents have been present and are giving lots of attention to the nest and their new chick. We hope it will be joined by a sibling soon! 7/6/15 – We were excited to see our first osprey chick yesterday, July 5, right on schedule. It was brooded by its mother, while its father brought back fish for the twosome. The chick appeared frail and we did not observe it begging for food. By this morning the chick did not appear to be moving, though the female was still tending to her nest. We continue to pay close attention to our nesting pair and all hope for the best for the remaining two eggs. 6/8/15 – A sad example of the impact of marine debris. Our staff had to clean up the nest to remove debris that was of concern to the health of the parents and their soon-to-be nestlings. 6/3/15 – Triplets! A third egg in the nest! The new addition was spotted today. 5/31/15 – We have a second egg! The egg was laid sometime in late evening of the 30th or early morning of the 31st. 5/28/15 – We have an egg! The egg was laid sometime yesterday or overnight. The incubation period begins and we should expect a nestling within 35 to 45 days – right around Independence Day! 5/8/15 – For the past two days, we have observed the beginning of nest building on the platform. However, the pair seems to be deciding between two nesting platforms in the area. 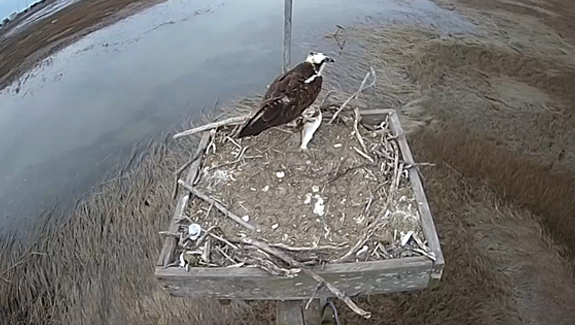 Should the osprey ultimately choose this platform, we will re-activate the osprey camera as soon as possible. Stay tuned! 4/20/15 – We are still observing regular visits from a pair of ospreys. They spend time on the platform but no nesting activity was observed yet. The osprey returned to The Wetlands Institute to nest in 2014! However, they did not nest on the nearest platform with the camera. 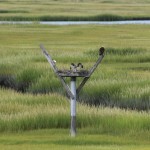 They chose instead to nest on a platform on the other side of the salt marsh. The osprey returned to The Wetlands Institute to nest in 2013! However, they did not nest on the nearest platform with the camera. 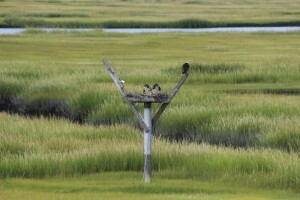 They chose instead to nest on a platform on the other side of the salt marsh. The osprey returned to The Wetlands Institute to nest in 2012! However, they did not nest on the nearest platform with the camera. They chose instead to nest on a platform on the other side of the salt marsh. Farewell to Hali, Luke and Giblet. 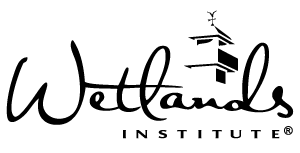 The Wetlands Institute’s resident ospreys have flown away for the season. We look forward to March/April of 2012 for their return! 9/18/11 – An empty nest. 9/8/11 – Only chick (soon to be fledgling) seen – both parents have left the nest. 8/1/11 – Chick takes flight! 7/19/11 – Chick seen hopping up and down with wings flapping. 7/4/11 – Chick growing larger. Being left alone in the nest as parents go out for food and nest material. Numerous family feedings spotted through June and July. 6/8/11 – Both birds seen on nest helping with feeding chick. 6/7/11 – Second egg still not hatched. Mother feeding one chick. 6/5/11 – First egg hatched! 4/10/11 – One bird is eating a fish while the other rearranges grass on the nest. 4/6/11 – Two osprey observed on and around the nest for most of the day. 3/31/11 – One osprey seen on the platform. It may just be passing through, and not a permanent resident. Osprey Frequently Asked Questions and Answers! Do the same birds come back to the nest every year? Osprey return to the same general area annually, but not necessarily the same nest. We think that the female is the same bird we’ve seen here since 2008; she has a rusty patch on the back of her head, and a band on her right leg. But since we can’t see the number on the band, we can’t be 100% certain that she’s the same osprey. When do they come back? Usually during the first week of April. 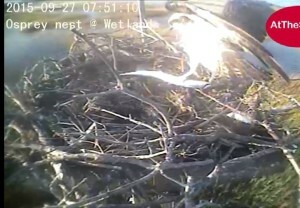 In 2010, this nest was occupied on April 2. When do they lay eggs? Eggs are usually laid within three or four weeks of their arrival. In 2010, the first egg was laid on April 20. Two more eggs followed within a few days. When do they hatch? Eggs take about 38-42 days to hatch. In 2010, the first egg hatched on May 29, the third egg on June 5. Do they have any predators? 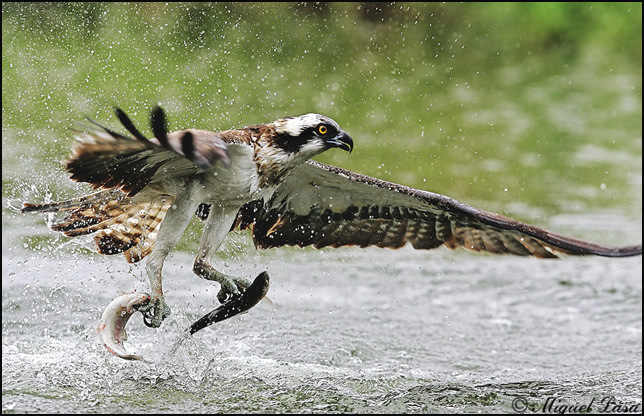 Adult osprey are apex predators, and not much will mess with them. Osprey chicks are vulnerable to gulls and owls, until they learn to fly, so you’ll usually see one of the parents hanging around nearby. What do they eat? Think you’re good at catching fish with a pole? Try doing it with your feet! Osprey fly overhead and look for fish, then dive in feet-first. Once they’ve caught the fish, they’ll rotate it in their talons so that it’s headfirst, which is more aerodynamic in flight. How many babies do they have? This answer depends a lot on the environment. If the weather is good, the water is clear, and the fish plentiful, they may lay three or four eggs. If it’s rainy and food is scarce, there might be just one or two. The first chick to hatch has the best chance of surviving, since it will be the biggest and get the most food. It’s not unusual for one chick to kill another. Most years this nest has only produced one or two surviving chicks, but in 2010 there were three survivors. When will they learn to fly? Osprey chicks grow up fast. Their feathers will come in during June and July, and by late July they’ll be flapping their wings in preparation for flight. Once they can fly, they’ll learn to fish. By mid-August, they’ll usually have started to migrate south. Where do they go? Osprey head for warmer areas, from Florida and the Gulf to South America. Males and females usually migrate separately, and spend the winter apart. Do they mate for life? Usually. But females have been known to “trade up” for a male that can catch more fish or has a better nest.